President Barack Obama hit the road Wednesday to press for the economic agenda he presented Tuesday night in his State of the Union speech. While on stage at U.S. Steel's Irvin Plant in West Mifflin, Pa., President Barack Obama signs an executive order to create a new type of retirement savings bond. At his first stop at a Costco store in Lanham, Md., Obama urged Congress to increase the federal minimum wage by 39 percent, but acknowledged that Congress might choose to not act on his proposal and that states might need to act on their own. “To every governor, mayor, state legislator out there, if you want to take the initiative to raise your minimum wage laws to help more hard-working Americans make ends meet, then I’m going to be right there at your side,” Obama said. He also told the crowd of Costco employees that he would sign an executive order requiring federal contractors to pay workers at least $10.10 an hour on new contracts. President Barack Obama talks about the minimum wage at a Costco store in Lanham, Md. “The defining project of our time of our generation is to restore opportunity for everybody,” he said. 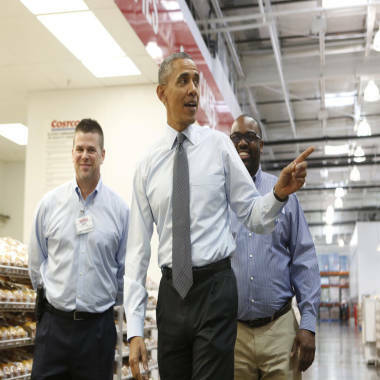 President Barack Obama gestures as he tours Costco Wholesale in Woodmore Towne Centre in Lanham, Maryland January 29, 2014. He then signed a memorandum directing Treasury Secretary Jack Lew, who was in the audience, to “create a new way for working Americans to start their own retirement savings” called MyRA. “It’s a new type of savings bond that we can set up without legislation that encourages Americans to begin to build a nest egg” through automatic deductions from their paycheck, investing in bonds that Obama said would “never go down in value” and would be backed by full faith and credit of the U.S. government.